The Hispano Ha-200 is a jet with several claims to fame. This little bird was an aircraft first and foremost designed by the legendary Willy Messerschmitt , his first post-war jet aircraft and jet trainer. The aircraft was a salvaged re-design of the Ha-100 – a propeller powered counterpart of the T-28 Trojan. Due to engine import issues, it was decided to salvage some areas of the design (such as the wings) and go for a jet trainer. This would replace an aircraft in Spanish service that Messerschmitt would be familiar with – the CASA 211 (a version of the He-111 bomber). 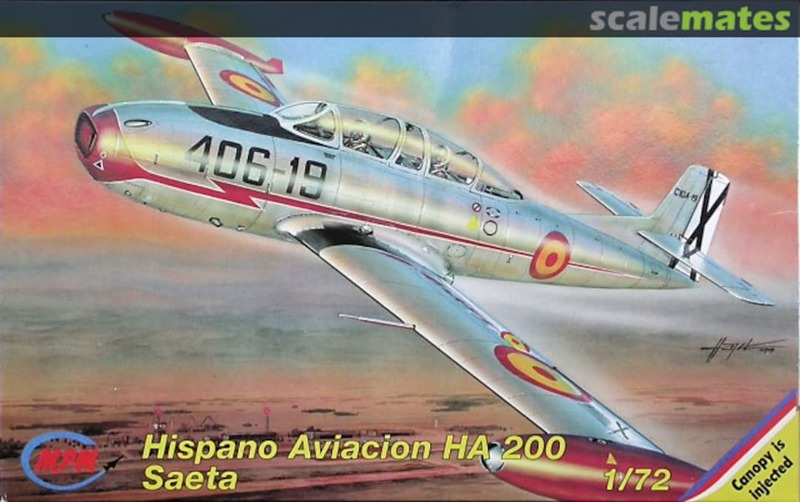 The aircraft was very successful in Spanish service. It was a jet trainer until it was replaced by the CASA C-101 Aviojet, and saw some combat too under the Ejército del Aire. It also saw production and use in Egypt, with the Super Saeta being used as a light combat aircraft to supplement the Egyptian Airforce whilst waiting for Russian equipment. The kit here is from MPM. It’s a short run kit, so there will be some flash or imperfections that one may not anticipate in kits from other brands. Frankly, upon first inspection, I found that sprues to be pretty decent, with not glaring issues. Even with issues, it’s a small price to pay for such a gorgeous subject in miniature. The construction is simple. It took very little time to get the kit assembled. It is worth noting that the small set of parts are not numbered/labelled, so take time to examine the sprues more so than usual before you begin construction. The fuselage comes in two complete parts, including the tail section. Wings come in the usual 4 piece configuration, which are then attached to each half of the fuselage. Rear section is 2 pieces again. Wingtips are made of 2 pieces each, which option for ‘glass’ fronts (I did not realise this until I began painting however, never-mind)! I also had half of my landing gear missing from my second hand kit – including the wheel well covers so these were scratch made and/or stolen from older kits that I no longer wanted to keep. The cockpit is also really simple, made up of instrument panels, and 2 seats. It would be really easy to adapt etch parts from similar configuration aircraft and add tonnes more detail. I did not do this and just stuck with an OOB (out of the box) version. In terms of painting, it’s relatively simple. It’s a raw metal scheme with orange nose and wing tips. This makes painting a breeze, just some pre-shading for variances in the metal with then a raw metal colour. I tried to match it up to pictures online and feel I did an OK job with it. It’s the first bare metal scheme I’ve done, but it seems to have come out relatively okay. The decals give a good variety. You can build the Spanish or Egyptian versions. The decals are crisp and colourful – which is great given how much vibrancy which lies in Spanish trainers. The Egyptian markings are equally well represented with their boldness, but I opted to go for the Spanish markings – at least on my first one. Application of said decals is very straight forward. There isn’t the amount of decals for detail that one might expect from say Italeri or Revell, but there’s enough to make the model look complete. They all fit well and are durable enough to withstand a bit of give for movement. What is even better, is that for the long thunderbolt on the side of the fuselage you get a plain white decal to help give the red even more colour on the model. The orange on the wing tips – as anyone who has done luminous colours will know – was not the most easy to apply. I actually resorted to using my brush to layer up the paint slightly thicker than usual so that I could get a smooth and consistent finish. What is also great, as you can see on the box, is the canopy is an injected canopy. Something becoming more and more standard in short run plastic kits. I didn’t manage to marry it completely smooth to my model – this became more apparent in photos. Overall, however, I don’t think it looks too bad. The overall finish of the model is beautiful. You get a graceful classic design in a classic scheme. It’s an aircraft that is pretty unusual, though historically significant for Spain and the legacy of Messerschmitt. I really enjoyed this model and recommend you grab it should you have the opportunity. Some more photos are below to show the aircraft in some more angels. Update: It has been pointed out to me that the model doesn’t contain the exit exhaust on the wing/fuselage blend. Unsure if this is something missing in my second hand kit, or an commission from the model, but it is worth considering. Interesting little aircraft I admit, I haven’t heard of beore. Thanks for bringing it up!